Looking for a unique camping experience? Just three hours away from Toronto, you can spend a weekend at a horror-themed campsite that will bring all of your darkest fears to life. Scarefest Scream Park in New Haven, Michigan is a premier attraction that specializes in all things haunted and horrifying. Open since 2006, the park has offered great hair-raising experiences, including haunted hayrides, houses, mazes and forest walks. 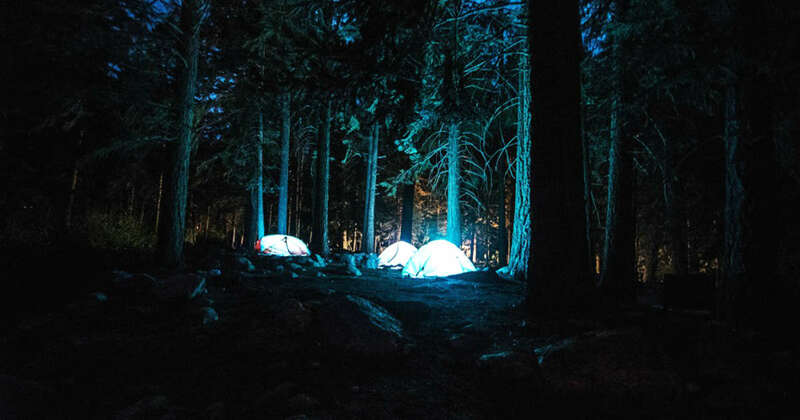 One of their coolest experiences is Survive The Night, which is an interactive haunted camping event for adults 18 and over. Located deep in a dark forest, the park staff plan 13 intricate hours of pure terror to unleash on courageous campers during their stay. The campsite will be plagued with all sort of scary beings, from flesh-eating zombies to chainsaw-wielding psychopaths. The park warns participants that the night will involve “intense scares, strong verbal content and adult themes.” You may also be moved, bound, handled and placed in uncomfortable situations. Of course, everything is guaranteed as safe and is for entertainment purposes only. The last event for 2017 will occur on Saturday, September 16, but if you aren’t able to make it this year, the park always holds Survive The Night camping yearly. Buy tickets online by visiting the Scarefest Scream Park website.